Become part of our proud tradition and support the Roxy! The Roxy Theater is owned and operated by the Fire Mountain Arts Council, a 501(c)3 nonprofit organization dependent upon our donors and volunteers. Donations are tax deductible. Since funding for arts education in our schools and cultural opportunities in our communities have declined, Fire Mountain Arts Council has been able to grow and serve an expanding audience that is eager for more! The generosity of our sponsors is critical for quality programming, continued theater operation, and scholarships. CLICK HERE for more information about purchasing a Roxy membership and the great benefits our members receive! CLICK HERE to make your contribution online or download our pledge card. Donors contributing $1,000 or more annually. Click here to set up your Sustaining Patron contributions online or download the FMAC pledge card. 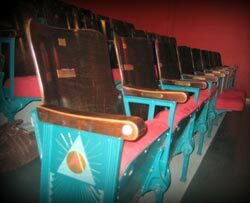 Volunteers have beautifully restored the historic Roxy seats. For $250, sponsor a seat in your name or the name of a loved one. A name plate will be attached to your seat, becoming a permanent part of the Roxy’s history. Many, many volunteers donating many hours! Sponsorship includes name recognition in our event programs. We encourage our audience and members to patronize our business sponsors. A color insert in the event programs, recognizing Season Corporate Sponsors (approximately 6,000 printed per season). In the donor display cabinet in the Roxy Theater Lobby. In the slide show played prior to each movie shown at the Roxy and complimentary show tickets. The knowledge that your tax-deductible contribution will be carefully managed to meet the Arts Council’s mission, enriching our community through the arts. No further solicitations from productions or events hosted at the Roxy Theater or Tiller Arts Center. And let’s not underestimate – that warm feeling of doing good for your community. View our generous corporate sponsors! Mission Accomplished! The Roxy Theater is free and clear! Thank you for supporting YOUR community theater! Digital Projection is coming to the Roxy! Thank you to our wonderful community of your support. View a list of Digital or Dark Donors. Contact us if you would like to donate time, funds or ideas to our projects! The Roxy Theater underwent a dramatic transformation and renovation during 2003-2007. We continue to acknowledge the support of our original donors who made the dream of theater, a reality in our Morton community. Please view the list of our donors.